"Those were golden days of communication and togetherness. Outside games with the kids on the street both before dinner and after until we were all called home to bed. Now, its an i-pod, or I-phone, droid, PSP, Nintendo DSI are sucking and demanding all your attention." "Yeah, it was great before those." "Well, before those it was plain old cell phones that always ring when everybody else doesn't want them to." "No, before that it was pagers, which buzzed or beeped incessantly, and seemed equally unnecessary until you got one and couldn't leave home without it." "Well, before then it was good, peaceful, with everyone singing songs and holding hands across fields of fresh cut grass." "Nope, before that it was portable CD players and Sony Walkmen and if someone was wearing headphones, your thoughts or ideas didn't have a chance." Head to Head Soccer I picked up at a tag sale just because it was from the same era of "Auto Race". In fact, it was probably the reason I got Auto Race, I or my parents were in a bid to keep me "cool" or current with the latest trends. When these games began hitting the stores (and leaving the shelves as quickly) they were mostly sports related. 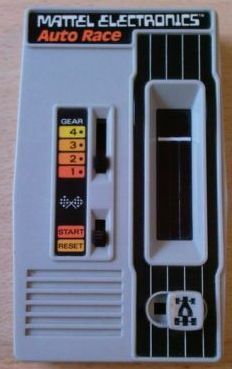 The most popular one I remember was the Football game, which could have been either the Mattel version or the Coleco version, but both were captivating to kids my age. Electronic game arcades, and the games' manufacturers, were "smart-bombing" pinball machines and they tried to emulate the same pay-off of excitement and challenge with electronic "beeps" and "buzzes" in a portable package. It worked, and for $30 $40 $50 and up you could have the arcade right in your hand. I grin at the "TV advertised" line. Almost as if someone in marketing had said "Damn! the As seen on TV slogan is taken! We need our own!" This was another popular genre of hand held games: Kill all the aliens you can! The beauty of Blip? In 1977, the obsession with Pong was so great that all you needed to do to sell a million units was create a similar game that didn't need a TV screen, make it portable...and call it "digital." There really wasn't anything digital about it. Blip was a mechanical game that you wound up and only required batteries for the single LED "ball" that went back and forth. If you want to be impressed, take a look inside at the Rube Goldberg-esque mechanics that went in to making Blip work. I was so obsessed with Blip, which is less a game of skill and more of chance in the way the randomness of the ball moves between sides. To send the ball back to either a human or "other" intelligent life force required figuring out where the ball would land and hit that corresponding number (1,2, or 3) to send it on its way. If you guessed wrong, the ball locked on your side until you released it with the "Serve" button which simultaneously registered a point for your opponent. The single player mode was brutal because the game would never miss a shot, so after a few rounds that mode became more like taking practice with one side of the Ping Pong table folded up. Anyone who owned Blip was usually left with one of 2 options: toss it, or Hack it. I chose the later (somewhere around 1985). Truthfully, looking at this after all those years, I'm not sure I actually did figure it out. If I had continued tracking the sequence for another 10-15 digits I would have had it for real. Well, it claimed to be a "digital" game..I guess that's what they meant. What was your favorite electronic hand-held game?